Over the past ten years we have developed a wide range of workshop games, using cards, role play and story telling. You will find them listed below, within each section there will be descriptions, materials and blog items. Still under development, so sparse in places. The latest is the Digital Challenge Game. Drew Mackie has written an article on how games can bring benefits to professionals and activists working on local projects. You can download the pdf here. David Wilcox and Ann Holmes were asked by the UnLtd programme - which helps social entrepreneurs - to run a session on business planning 'as if people mattered as much as the figures'. You read about the day and workshop tools they used in October 2003 here. Games can be used even when you have a large number of people at a conference, and not much time.Here's what we did for the National Housing Federation when their information technology specialists gathered in Telford for their annual event earlier this year. Last's night Salon about public participation at the Civic Trust went really well ... subject of course to any contrary opinions participants might wish to add below. Our engagement technique was simple and well-tested - ply people with lots of free wine* and encourage them to circulate. We added a few props ... over-sized badges, and flags. The idea of the badges was that people added a few words about things they might wish to discuss with others. My designer friends at the Civic Trust took to the idea enthusiastically, and provided people with mini-placards which certainly did the job effectively. The flags idea was something Drew Mackie and I have done before to help people cluster into groups ..... find a few other people with a shared interest and you get a paper flag to write your interest on and wave to attract more people. In the event everyone was so gregarious that not much was needed to encourage circulation. We got into the appropriate frame of mind right from the start with some excellent jazz piano from Charles Condy, husband of the Trust's Heritage Days Manager Katya. The Trust has been around for nearly 50 years, encouraging high standards of planning and architecture. It's had its up and downs over the years, but I sensed a lot of energy among its staff. The Trust's director Peter Bembridge has a technology background, unusual for an organisation in the planning and environment field - so I'm hopeful we'll see more of the Trust's activities reflected online. I know there is interest in equipping the hundreds of local civic societies, supported by the Trust, with better communication methods. Amidst all the fun we also talked about participation, engagement, co-creation and such. Apart from one dissenting voice there was general interest in how to mix online activity with face to face workshops and other techniques, and I promised to set up a site where anyone interested could try blogs, wikis and other Web 2.0 tools. My son Dan is grappling with Drupal modules and Flash plugins, and we should have a sort of online salon running soon. Quite what we'll do about the wine, I'm not sure. The difficulty in doing this exercise is combining two areas of expertise, and two groups ... those who understand the technology, and those who understand people and their everyday lives. There isn't always enough overlap. Last night we started from the people side, and offered the local experts of Lawrence Hill, meeting at Community at Heart , some props to help them get to grips with the technical. We didn't say so at the beginning, but it was the first time that Drew Mackie and I had tried out the workshop game we've developed for the Digital Challenge project team. Here's how it worked. Before the event, we assembled a set of over 30 cards which represented the range of projects that any Digital Challenger might consider in their bid. You can download the cards as a pdf here. Kevin O'Malley and Steve Parry, who are working on Bristol's bid, pulled out ones that most matched their ideas. They included community access, wireless networks, mapping linked to social media, storytelling and a content aggregator. Then after an introduction to the Digital Challenge and the purpose of the game, the locals split into two groups to work with Steve and Kevin. We gave each group a set of cards split into the pre-determined "must haves", plus optional extras. We also provided a cast of fictional characters - download here. The first task was to review the characters - who should benefit from the Challenge programme - and make sure there was a possible match between their needs and the ideas on the cards. Additional ideas could be added. It worked really well. Not only did everyone manage to understand enough of the technical options to contribute, they were able to turn these into life-enhancing stories any of their neighbours could understand too. The secret, of course, was conversation. People could fill in gaps of understanding for each other, and spark ideas. We only had two hours for the whole exercise, so the stories were outlines. Given more time, perhaps on another day after time for reflection, I'm sure we could have filled them out substantially ... and the local Connecting Bristol team will continue the discussion. I asked two people how they thought the event had gone. Local artist Jenny Sheehan (left) said she felt that the exercise helped to make a connection between technologies and people, and trigger thinking about how it could really help transform people's lives. A collaborative, community approach meant there was scope to bring costs down, to create a resource bank, and encourage skill sharing. Kevin O'Malley (right) is one of those responsible for developing the Bristol bid, and he said that so far a lot of the bid development had, inevitably, been technical. The evening's exercise provided a way of bring this work into the realm of real people, with real issues, in a real community. Drew and I felt some satisfaction that a low-tech set of props (bits of paper) had help bridge the people-technology divide. We'll revise the game in the light of helpful suggestions from the players - who said they didn't mind being first testers - and post it here with results from Bristol and revised instructions. In January we are running a session in Manchester. Comments on the Bristol session on my other blog. The purpose of the Digital Challenge Game is to help teams who are developing bids to involve other interests, and also test their proposals against possible problems. It should help in the development of storyboards for the final submission. The game components include cards for personas, projects, and problems, and a story-boarding sheet. The game takes about two hours, and works for any number of people working in teams of 5-6. The target audiences for the programme. These are represented on "persona" cards giving personalised characters with histories and needs. Player must decide which audiences are targeted by their programme and prioritise cards accordingly. How the projects fit together to form a coherent programme. Players now "run" their programme through several years. This is done by telling the story of the programme as it progresses from bid to set up to implementation. Players are encouraged to think through the pitfalls and opportunities that might occur. As this story is being recorded on a "timeline" sheet, the game facilitators will feed in "crisis and opportunity" cards representing external factors that may affect the programme. These are designed to trigger group debate. Players develop storyboards for the personas. As the game overview sheet explains, one of the first tasks for players is to develop or choose some profiles of people who will benefit from the programme under development. The personas will feature in the development phase of the game, and storyboards are developed showing how people use different technologies. What is their age, gender, ethnicity, life circumstances? What are the challenges that they face? What skills and interests do they have? What level of experience and confidence do they have with technology? You can use the personas below as they are presented, or as a starting point. When we develop the full game instructions were will put these on cards. Yvette is 14, and spends a lot of time online in mySpace. Her mother is worried that she may be at risk from pedophiles in chat rooms. Tracy is 18, and lives at home with her parents and young baby. She's worried about losing touch with friends, and also wants to get a job and a place of her own. She uses her mobile phone to keep in touch. Beryl has just retired from factory work, and lives alone. She has some mobility problems, misses her work friends and has difficult with shopping. She has never used the Internet. Aziz runs a neighbourhood convenience store, working long hours with help from his wife and older daughter. He is well-liked in the community, but worried that Tesco are going to open a small store nearby and he will lose customers. Jenny has been heavily involved in local community groups for many years, and now finds that as a representative on partnership bodies she is expected to use email and the web. She believes she has a right to paper communications, and is resisting using any technology. James is a neighbourhood renewal worker, keen to ensure that different interests in the community find their voice and gain recognition for the contribution they can make. However, he can't get people to turn up to meetings. Jackson, unemployed, is a member of a band who are now getting some local gigs. He is keen to make more of this opportunity, but doesn't feel he has the necessary business skills. Sonya is deaf and wants to gain some qualifications and then a job using the Internet - but doesn't know where to start. Jack is a single dad with twin daughters. He is unemployed with a respiratory disability. School teachers say the twins, Paula and Louise, are bright but not interested in learning. The household doesn't have a computer. 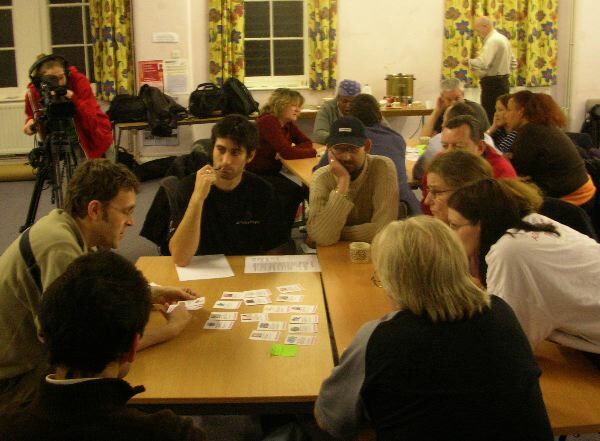 As the Game Overview describes, during the planning phase of the game participants first develop Game personas to represent people who should benefit from the programme, and then choose a set of project cards. These represent technology projects and other activities. Participants are given a budget - say, 15 points - and asked to choose project cards appropriate to the personas. Blank cards enable participants to suggest additional projects. Below is the content of cards developed so far. Please suggest changes, or leave more ideas, as comments. These won't appear immediately because they require approval to avoid spam. 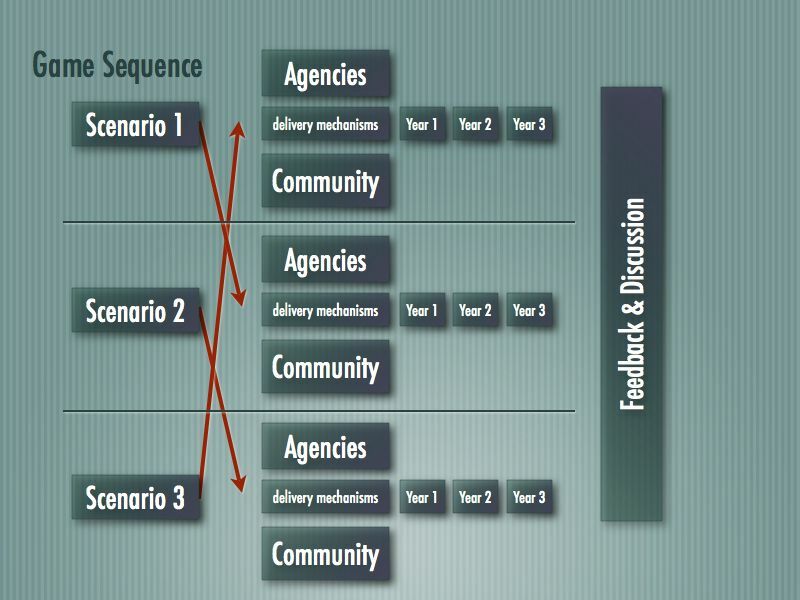 Public bodies coordinate delivery of services over a range of media channels. Local individuals and groups are offered training and support to help them engage more fully in local projects. People have access to multi-media facilities to develop their own projects. Individuals and groups are offered help in developing weblogs and other forms of self- publishing. Needs: volunteer or staff expertise. People can use audio, video and web pages to raise issues of personal and community interest in their own words. Needs: major development initiative and maintenance. Nonprofit organisations are given help to improve their administration and effectiveness by using technology. Support provided for small businesses in using the Internet. The project manages and develops a wireless broadband system. Needs : Messaging system, co-ordinator. Volunteers and mentors help users with technical and other problems. Course material and informal learning systems are developed with colleges. themselves and prepare action plans. Setup a job club using the Internet and CV advice/design. Needs: Trainer/support worker. Links with partners. The project recruits, trains and supports a network of people who will champion the use of the Internet. Needs: Training and support programme, equipment. 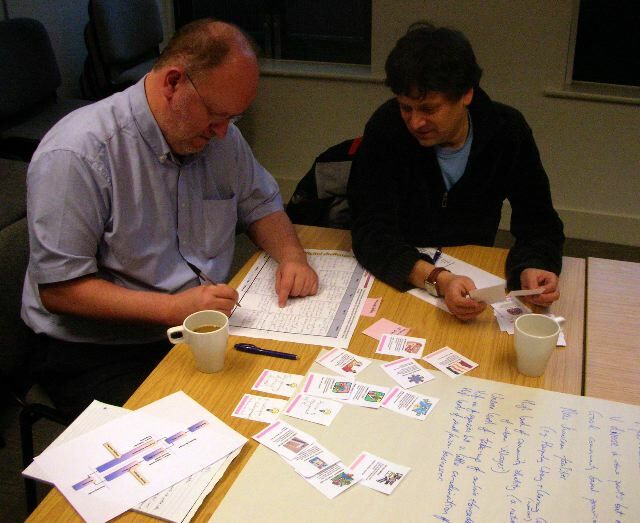 Once game participants have created personas and chosen project cards - as described in the overview - their main task is to play through what is likely to happen within the programme, and what benefits it will offer to the people described in the personas. This is done by telling the story of the programme as it progresses from bid to set up to implementation. Players are encouraged to think through the pitfalls and opportunities that might . As this story is being recorded on a "timeline" sheet, the game facilitators will feed in "crisis and opportunity" cards representing external factors that may affect the programme. These are designed to trigger group debate. Players develop storyboards for the personas. While game participants are developing their story of what's happening to the programme - and to the people profiled in the personas - they will be encouraged by the game facilitators to think about various opportunities and crises that may occur. The facilitators may feed in some cards outlining possibilities. If you have other ideas, please add a comment below. The engagement game is designed for situations where one group wishes to involve a wider range of interests in something that they are planning to do. This might be, for example, a programme of neighbourhood improvements, a policy discussion, or development of an organisation. We have tried to make the game as flexible as possible. The organisers - who we have called the programme team - might be open to a wide range of ideas for the start, or they might only be prepared to offer some limited opportunities for people to provide suggestions. They may offer involvement though a range of methods: surveys, events, online discussions. The game is played in a workshop setting, with groups of 4-7 spending at least an hour with a set of cards and other "props". They first explore the situation, and the purpose of engagement, then use the cards to generate ideas for involvement and action, and finally move to generating stories about what may happen. 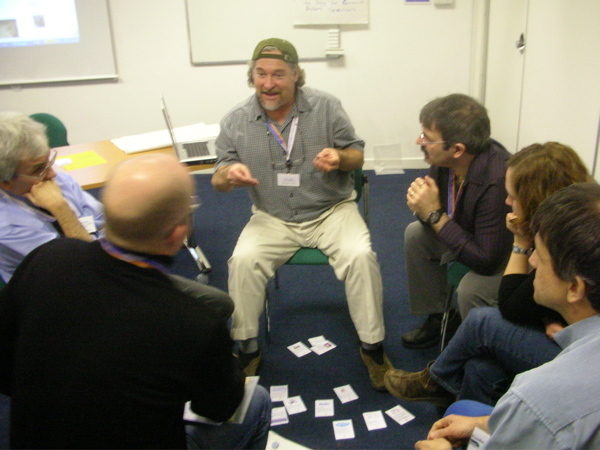 The game can be played "for real" to help design an engagement programme, or as a simulation at a seminar or conference with a larger number of people. It's a good way for people to start exploring the wider issues of participation and engagement. Development of the game during 2006 was funded by the UK Department for Constitution Affairs - now the Ministry of Justice - as part of their democratic engagement programme. We built on this game development with further funding from what is now the Department for Communities and Local Government as part of the Digital Challenge programme. That led to the Digital Challenge game, which you can find out about and use here. These pages provide specific instructions for the engagement game, and more general information about our games. Instructions for playing the engagement game "for real"
People and participation.net site by Involve for planning tools, case studies and guides. The other day I ran a workshop for PR and communications staff who are working in housing associations, and I've put the presentation and game that I used on the social media wiki. The cards are much the same as those used in other games, but after groups had invented the scenario (a housing organisation wanting to improve communications) I asked them to think about two dimensions. First, who was the main focus for improved communications (Board, staff, residents, others) and then what benefits were they looking for: improved consuming of information, better communication, and/or collaboration. After that the groups considered what communication methods would be most appropriate. They then choose communication methods from a set of cards. Each card has 1, 2, 3 points - budget is 15. ... although we didn't get time for the storytelling. I think that it should be possible to develop this game for The Membership Project, where as I reported earlier we need some ways to help organiaations explore the implication of social media, and how to use it. Meanwhile you can download everything from the wiki. You can play the engagement game "for real" - as described here - or as a simulation at a conference, or training session, for example. It's a good way to help people understand what may be involved in participation and engagement programmes. 1. Use a room where people can split into groups of 4-7 and work around small tables or flip charts. You can play with any number of people - but may need more than one facilitator if you have a lot of groups. 2. Start by inventing a situation - the context for the game. We find it is better to invent something on the spot rather than use pre-prepared situations, so people feel involved. It can be done group by group, or as a whole. More below on this. produce your own using a template. 6. Facilitators may throw in crisis or opportunity cards, representing events that may impacy on the engagement programme. 7. Groups then report back on their plans and stories, and discuss next steps. If you are short of time, you can do the report back after 4 ... but we find a lot of insights come when groups move from the project planning mode into storytelling. A set of cards and other materials: character examples, planning sheets, story sheets. the purpose of the workshop, and help them reach useful conclusions. Spend about 10 minutes inventing a situation with the whole room, which everyone then plays through. Use this if time is tight. Use the check list below to ask people to offer up suggestions. Ask each group to invent a situation which they then pass on to another group as a challenge - "make it as tough as you like, you won't be solving the problems". Of course, each group gets someone else's challenging situation! This is more fun, and you can suggest each group invents a different situation, by giving them a headline about the locality, organisation, group. Where is this - locality, organisation, network? 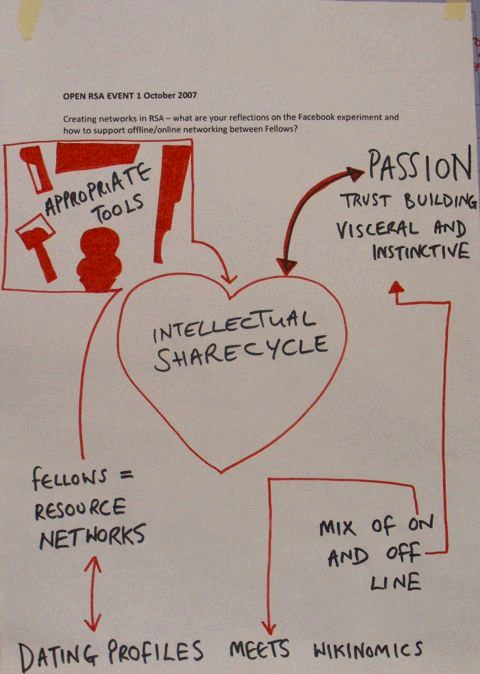 Who is involved - the key interests you wish to engage. What is the timescale - when does this have to be completed? The rest of the game then addresses the "how". co-creation? The reading materials listed on this page have more on this. if the programme develops as described in the card-based plan. involved, you can get different perspectives on how things may develop. Drew Mackie and I have been funded over the past year to developed a game for designing engagement, by what is now the Department of Justice, previously Department for Constitutional Affairs. The other day we went back with a version that aims to meet current Government interest in using a mix of social media and other methods. The first version of the game focussed on face-to-face engagement methods, and had quite a complicated board - as you can see from this report of an earlier session. This time we added in blogs, online forums, MySpace, wikis, social bookmarking and other goodies from the world of Web 2.0, to complement workshops, exhibitions and deliberative processes. We also made the sequence of play simpler, and were able to bring in elements from the Digital Challenge game developed for the Department for Communities and Local Government. Ian Johnson and members of his team took 90 minutes out of their busy departmental reorganisation schedule to develop a scenario around energy policy, and then set-to choosing appropriate methods to engage a wide range of interests, Drew livened things up by throwing some challenges into the emerging storyline ( new climate change study produces gloomier results). In particular, the inclusion of many social media methods into the game was instructive - not least because it teaches participants that none of this is an add on and that all activity requires resource, commitment and time. Since Jeremy is also helping Cabinet Office assess the opportunities for government communications of social media we were doubly pleased. Our next step is to tidy up the various versions of the game, and make them available on this site. Meanwhile you can download, as pdfs, the game cards and the game instructions. Our experience is that effective engagement is as much about attitude as method. Too often consultants are hired to run programmes with the client at arms length ... with the result that when the results come in the response is inadequate. That's even more likely when new media is part of the mix. OK ... I know they are paying us ... but it is heartening that DCA/Department of Justice officials are prepared to try the techniques that we and others are developing, and that through Jeremy they are out there actually using some of the new ways of engaging. Report at Designing for Civil Society on how we developed and played a governance game, with instructions. There's also a report on a session at the same conference to develop communities of practice - fast. I'm looking forward to the conference on neighbourhood governance and community engagement organised for CDF by Kevin Harris next month. If that sounds bit challenging, but be assured that Drew Mackie and I will aim to liven things up with our Neighbourhood Governance Game. As Kevin reported previously, we had a lot of fun with a dry run last November, when groups invented semi-fictitious neighbourhoods and then planned improvements together .... or not very together. One participant honestly reported at the end: “we found it so difficult managing internal stakeholders we never got round to talking to external ones; we started consulting people at the end of the process as a way to generate consensus, not the beginning as a way to frame the task. Personally I was appalled by own behaviour - I started off accusing my colleagues of slipping into policybabble rather than plain english, and yet happily charged through to the end of the process without once asking anyone in the other room what they thought”. The event will be chaired by Carol Hayden, Associate Director, Shared Intelligence. Speakers include Mark Hitchen, ODPM Neighbourhoods Team, providing an update on the government proposals; the Young Foundation's Paul Hilder giving an update on the Transforming Neighbourhoods programme; and Susie Hay, regeneration and participation consultant, discussing the importance of informal networking at local level. On that form, the rest of the conference will be both lively and enlightening. Bookings and enquiries: Cheryl.Roberts(at)cdf.org.uk, 020 7833 1772. There's a leaflet here. 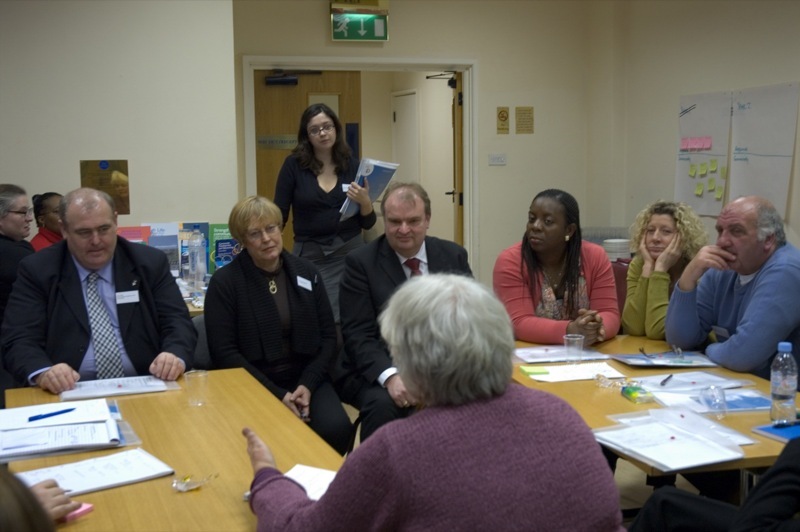 Neighbourhood forums are one of the methods for local participative democracy promoted by UK central and local government - but what do they mean in practice? We found out by inviting people to invent a place, create a forum, and tell its lifestory - all within an hour. As Kevin Harris has mentioned on his Neighbourhoods blog, we both ran a little storytelling game this week on the theme of how to set up a local forum. It went really well, proving to me anyway that an hour's conversation among a few interested people can provide as many insights as a manual that probably won't be read much anyway. The occasion was a Quest Trust networking event, and the reason for the particular game was that UK central and local government is pushing hard their local:vision policies for more effective citizen engagement in neighbourhoods. One mechanism for this will be establishing neighbourhood forums to discuss local issues and action. There'll be a national framework, and neighbourhoods charter, and locally citizens could have a chance to deal with issues like anti-social behaviour, delegating budgets to ward councillors, model byelaws, and neighbourhood contracts with service providers. The think tank Demos has produced a learned pamphlet on Everyday democracy, and a Conservative group is promoting Direct Democracy with an agenda including local decision-making. Participative democracy is very fashionable, probably because of rising concern among politicians that people are losing interest in the non-participative kind. Our challenge at the Quest event: how do you help people plan some practical action, and bring the policy ideals down to earth? 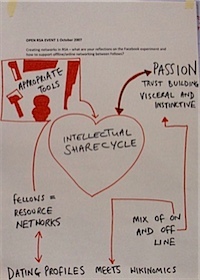 We used a technique developed by my colleague Drew Mackie, and quite simply asked people to tell the story of a forum. First of all, as a group of ten people, we invented a local ward - with roads and rail, schools, church and mosque, homes good and bad, greenspace and grot.... inevitablely call The Sink. We then split into two groups each with a poster-sized sheet of paper divided horizontally into sections: starting, setting up, developing, running.... and just talked about it. Although people hadn't worked together before, the groups rapidly pooled their experience to come up with a narrative taking the forum from initial inspiration through to the very real challenges of accommodating different views and interests while dealing with the complexities of local government and public agencies. Kevin and I spiced things up a bit by throwing in some crisis cards: bad media coverage, demands for a representative constitution, forum chair runs off with a grant....it was a lot of fun. As Kevin reports, one of the issues to surface was that it is unrealistic to think that just living in the same place is enough to bind people together into a forum. People respond to the issues that affect their lives, or form linkages with people who have similar interests. As one person remarked, you may be able to pack a meeting with people when the residents' parking plans change, but find only a few next time for business as usual. Kevin and I will be developing the game further with Drew, so do get in touch if you would like to know more or try the game for yourself. Download cards sets from here ... and then choose an appropriate set, or make up your own. Most of the sets are a mix of online activities and other things that you will need to do to get people involved. You might also take a look at the sustainability game developed to help UK online centre think about how they may fundraise, attract volunteers, trade or get help in kind. We have developed a new set of cards for the community networking game, to play with participants at a community technology conference in Brighton, UK. I recently put together proposals for a potential client on how to set up a network for practitioners working in the field of community participation, and as part of that outlined a possible network planning game. Add up the 'needs' on the cards to show staff, funding and other resources needed. There's a space at the bottom of the planning sheet. Comments, queries welcome below. You can download a short guide to setting up a network here . The Regeneration Game, which enables groups to plan a programme of projects to improve their neighbourhood, is now available as a boxed version with four sets of cards, instructions and planning sheets. You can order from the NIACE site. The Regeneration Game is based on a range of games developed since the mid 1990's by Drew Mackie and David Wilcox - many of them designed to help groups plan technology projects. You can see some of those at the Making the Network site with free cards and instructions. The boxed game includes sets of 52 cards with ideas for regeneration projects, planning sheets, and instructions for facilitators. It also has a booklet on how games can be a highly effective way of helping groups solve problems, and information about where to get funding for many of the project ideas on the cards. The Regeneration Game has been developed with Jane Thompson and Cheryl Turner of the adult learning organisation NIACE, that has also designed and published the game. 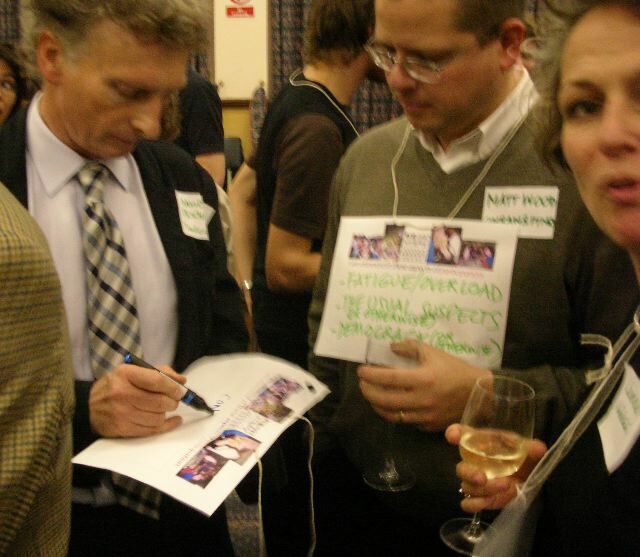 They write: "Participation and partnership are accepted as fundamental to successful neighbourhood renewal and yet on the ground, residents are increasingly sceptical and tired of 'being consulted', activists are overwhelmed by the demands of more meetings, and policy-makers are frustrated by delays in achieving crucial results. Doing more of the same is not enough. We need credible and imaginative new ways of supporting diverse groups of people in working and learning together. The brief: provide a group of big-practice architects with some latest thinking on community engagement and social media. Time available 45 minutes. Budget: modest. Solution: carefully crafted presentation and hand-outs? Not my favourite approach. Game with lots of props? Tight on time, and difficult to get right without a lot of research. I was a bit stumped ... but the location and time-slot gave me the clue: lunchtime and a flexible corner of the office. Time was when people in offices had enough time at lunch or coffee break to catch up on the gossip and also share some insights and news of what's going on in different areas. These days it seems to be grab a sandwich, get back to the cubicle, and keep ticking off the 15-minute slots on the timesheet. So - why not re-invent the learning lunchtime? Fortunately my clients, PRP architects, in the form of Alexandra Rook and Lesley Gibbs, were happy to try something different. Alexandra, in her previous post with the Civic Trust, had been a strong champion for the salon we ran there successfully ... but you can't bring in the bottles at lunchtime. We came up with a simple formula: create the outline of an only-slightly-fictitious scenario about community engagement on a housing estate, then invite 20 people to split into groups once they had grabbed their lunch. Three people stood in for the development group: contractor, council and housing association. Others were residents, architects and evaluators. Simple briefs explained that the residents were disgruntled after initial consultation raised expectations but didn't deliver good results - and invited each group, in slightly different ways, to think what to do next. You can download the briefing notes here, and a note about engagement methods (both pdfs). I also offer presentation notes from this item on Relationship-based engagement. After half an hour we stopped to share some insights, and that sparked some stories about real-life programmes. I particularly liked the one about the team who used the talents of a cartoonist to develop big King Kong posters to advertise events and planned changes. The local kids whipped them off the notice boards and on to their bedroom walls ... parents got talking ... people turn up. The poster about the concrete-nibbling monster had crowds on the street awaiting the arrival of the demolition equipment. I hope the modest exercise helped people make a few new connections in the office, and that other events may follow. Or alternatively, as someone who previously worked in the construction industry said: "We always had a tradition of going down to the pub at Friday lunchtime, and staying there. That way you always found out what was going on." Too simple, much too simple. We have developed a set of questions and answers about The Regeneration Game, and would welcome more of your questions and comments. Read on below, or download Q and A here. More here about the launch of the game. Please add comments and questions on The Regeneration Game by clicking 'Comments' under this item. You can now buy the game online from NIACE. Just what is The Regeneration Game? It is a card-based game to help groups discuss how to improve neighbourhoods, and then develop action plans. How can the Regeneration Game be used? It can be played ‘for real’ in local communities, or in training sessions to help people understand the challenges of neighbourhood renewal. Who might use the game? Anyone who is trying to get different interests involved in planning neighbourhood regeneration – adult and community learning practitioners, development workers, activists, residents, trainers. In addition, anyone training people in community engagement techniques and processes. The main components are packs of 52 cards with project ideas, action planning sheets, instructions on how to play, and information about where to get funding for projects. The game is best played by a group of about eight people. Each game box has materials for up to four groups to play at the same time. A game session depends on the complexity of the situation, and the length of discussion generated – but it is best to allow at least two hours for play and discussion. What is involved in the game? Groups identify problems they want to address in their neighbourhood, choose project ideas from cards and add their own. They then develop an action plan, and look at the skills, funding, and partnerships that might be needed to make things happen. You can buy the game online from NIACE. Games can produce rich discussion and consensus in a short time; they create a level playing field for professionals and residents; they help people get to know each other. They are also more fun than most other meetings. Download article on Why games? What special about this game? 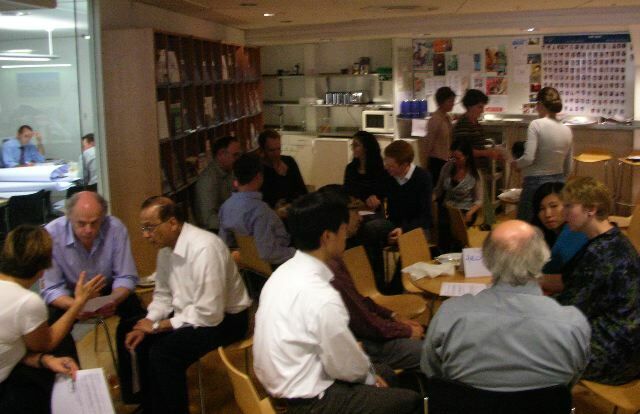 It combines a number of well-tried techniques to promote group discussion; it is designed for use in a wider process of community engagement; it offers high quality materials that can be used in community and training sessions. Is the game only for use with community groups? No – because effective regeneration depends on a wide range of interests developing a shared commitment to change. The game is designed for use within regeneration agencies and partnerships too. By playing the game different interests can develop a shared vision. How was the game developed? The design of the game is based on workshops run by Drew Mackie and David Wilcox over the past ten years. You can find similar – but less polished! – games on their web site . This version, and supporting materials, was developed with Jane Thompson and Cheryl Turner of NIACE, and their design team. Does a game session require skilled facilitation? No – there are full instructions on how to plan and run a session. Because the cards are pre-prepared groups have plenty to talk about from the start. Do the pre-prepared cards lead to standard solutions? There are blank cards for new ideas, and participants are encouraged to amend cards using Post-it notes. If you like the game, but want to start with a different set of ideas, you can make up your own cards. What sort of venue is best for the game? Somewhere that people can work in groups of about eight people in the same room. You will need flip chart paper – and easels if possible. You can sit people around tables – but the best sessions are often when people just spread the cards on the floor. What other props are needed? As well as flip chart paper you will need Blu-tak or similar to stick cards on the paper, pens, and Post-its or other sticky notes for adding ideas. Can the materials in the box be re-used? The cards can be re-used, and there is a template for copying new planning sheets when you need them. What makes for a good session? We offer advice in the instructions. Generally, make sure people know the purpose of the session, make it an enjoyable and creative experience, and be clear about what happens next – if the game is part of a development process. Is there a danger the game will be used as a ‘quick fix’ for community participation? There’s always a danger that workshop tools are seen as ‘the’ answer, when real participation takes time. David Wilcox has written The Guide to Effective Participation, available as a free download from http://www.partnerships.org.uk/guide/index.htm, which deals with these issues. We think there’s less danger in using The Regeneration Game because it is unpretentious and encourages wide-ranging discussion and questions. How might the game be used as part of a longer process? We give some suggestions in the game instructions. You might use the game as an awareness-raiser early in a process to start people thinking about issues, possible projects, and priorities. You might use it later when project ideas have started to emerge. And you might use it at several events, with agencies as well as community interests, to develop shared visions. What is important before and after a game session? Before the session – if played ‘for real’ - get to know who’s who and make sure people who might be interested are encouraged to participate; find out what is already happening in the neighbourhood; make sure people know the session will be a creative event not a standard public meeting. After the session keep in touch with those who participated and follow through on any commitment made. Think about how to engage other interests necessary to the success of neighbourhood regeneration. 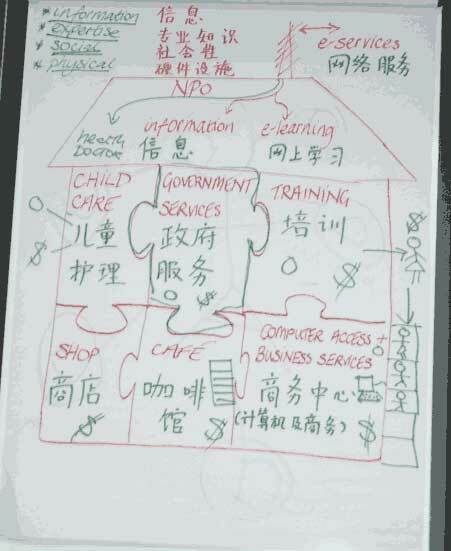 Chinese social entrepreneurs now have the benefit of some innovative (and fun) planning tools to help improve urban and rural neighbourhoods, thanks to my friend at ruralnet|uk, Jane Berry. I think Jane picked up some ideas too. A couple of weeks back Jane called to say she was off to Beijing, and please could she have some games to take. No surprise, since she has been a collaborator with Drew Mackie and I over the past few years in developing workshop techniques to help people work out how to set up everything from online community networks to technology centres and one-stop rural service hubs. Fortunately our development partners NIACE rushed over a couple of boxes of The Regeneration Game, and you can see the hand-over here. Jane says it was rather more than a formality, and local people at the Shining Stone Community Centre quickly put together their own version of the game which, as her official press release says, led to "heated discussions" into the evening. Some things are the same the world over. The trip for three UK social entrepreneurs was organised by GLI - Global Links Initiative - and was supported by the British Consulate-General, Shanghai. Jane's sessions went beyond the Regeneration Game, and in the pictogram on the flip chart (right) I can identify an attractive and intriguing version of ruralnet|uk's model for a sustainable multi-use service centre. 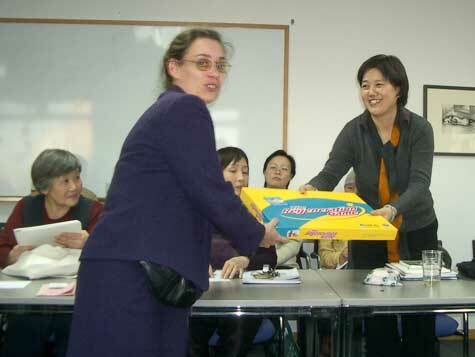 Update: Jane told me: "I was delighted to find Chinese community groups much more open and dynamic than I had expected, unexpectedly vocal in their insistence on participation, self-determination and the need for change, and anxious to learn lessons both from within the country and beyond. There is a strong recognition that the next steps for Chinese non-profits are to work more closely with each other, as well as to find ways of reflecting the needs and wishes of their target groups." Drew Mackie and David Wilcox ran a session at the Ruralnet conference about social capital, and used simple scenario development to help people explore how social capital relates to physical, human, financial and environmental capital. You can download their presentation and instructions here. Sometimes challenging the brief provided by a client pays off for all concerned - and so it proved yesterday when Drew Mackie and I were invited back to Pendle for a conference on community cohesion. The event featuring work we had done aiming to help different communities - white, Asian, rural, urban, young, old - understand each other better following riots in north west England a few years ago. The brief put out to tender by Pendle council last year was fairly conventional - carry out a study of local attitudes that could be used as a baseline to see how far new programmes to promote cohesion increased neighbourliness and trust. We've never been ones for clipboards on the doorstep, and prefer doing projects that lead to action and not just another report on the shelf... so we suggested something entirely different. As I've written before, we proposed that we run workshops at which residents invented fictional characters and told their life stories, so we could analyse the issues that surfaced. To our surprise, we got the job - and pressed ahead with a storytelling kit developed by Drew that we could use and also hand on to local groups to use. It's the sort of thing that could fall flat, lead to pieces in the paper about wasting money on tale-spinning focus groups, or at best a polite thank you for the report but no follow-through. In fact it all turned out really well, thanks to the enthusiasm of those taking part, support of the council and Pendle Partnership and some excellent local voluntary groups like the multi-faith organisation Building Bridges. You can download our report here (4M pdf). Yesterday Pendle council proudly invited groups from around East Lancashire to hear what had been going on. We did a presentation along with others, but the most interesting parts were the reports from groups who had developed stories using the kit - without our help - and the discussion among participants of what other techniques were working well. Roy Prenton, editor of the Nelson Leader, talked about the "myth busting" cartoon strip they were now running as a result of our work, and there plenty more new ideas bubbling up around the tables. I think the whole exercise was successful because of two things: first that there were some individuals and organisations in Pendle ready to try something different and carry it through. Second, the technique that we used was designed to stimulate the sort of stories and conversations that are part of people's day-to-day lives. Drew and colleagues are now using similar storytelling techniques in Blackburn and Bolton. Clearly it's something that appeals to Lancashire culture. Programmes for social inclusion, community cohesion, civil renewal and regeneration operate at two levels: that of the official policies, targets and consultancy speak; and that of the people living in communities being studied, renewed and evaluated. The easy option for public bodies is to stay in the comfortable setting of the first levels - but more is likely to happen if they support ways of doing things that are part of the second. You can hear first hand what the council thought of it in this Quicktime movie from Sarah Gaskill (right), our main contact during the work. I'm editing more videos to post in a day or so. Brian Astin, Pendle council corporate strategy and partnership manager, says that storytelling provides a useful complement to harder edged policy and legislation. Both carrot and stick are needed. Rauf Bashir, from Building Bridges, explains how they used the storytelling approach in primary schools. Marcia Allass, developing the Pendlelife portal, explains how the Internet can help with community cohesion. The game aims to help people design a programme ... which might include regeneration projects, participation activities, or technology development. In this case we'll be looking at how groups or organisations might use social media, and other activities for ... well, whatever they want to achieve. I ran something similar at the Circuit Rider conference back in January, as you can see here, and it went pretty well. This time I've done more work, talked it through with Ann Light, know there will be some really buzzy people taking part, so I know it's going to be fun. Put simply we'll start by inventing a scenario, and some characters, then look at a set of methods on cards , choose those that could be useful, put them into some sort of order, and tell the story of what happens to the programme and the characters. I'll be throwing in a few challenges to liven things up. I've uploaded the full instructions here (zipped pdfs 2M), and you can see other similar games on our usefulgames site, including one developed for the Digital Challenge programme. I think it went pretty well on the day: we tackled two scenarios ... one about conflict over water rights in Spain, and one on climate change. Drew Mackie and I were delighted to find that they could, not least because of the enthusiastic way in which Dave Carter (with Gary Copitch in the picture) led his colleagues in stories about Jack, lone-parent with twin daughters, and the Malis, recently arrived from Somalia. Tell the story of how they use the technology ... while we throw in a few life crises and opportunities along the way. Jack has severe health problems and no computer skills, but with local support ends up in a self-help online health group, and running an E-bay trading setup with his daughters. Mr Mali becomes a local councillor running online services for his constituents, while Mrs Mali uses the Internet extensively to further her career as a health care professional. You can download the game kit we used, and the stories that resulted, from the links at the end. The stories will help Manchester in developing storyboards for its Digital Challenge bid, and once that is out of the way I think that Manchester, Bristol and others may be interested in how these workshop techniques could be used to help local organisations and residents explore what digital development programmes will mean in practice. We got six people from different Black and Minority Ethnic groups and I split them into 2 groups. I did a bit of a brief on the bid itself as people were interested in what it was. But it also gave a concept on what was possible within Manchester. I then asked participants to come up with an identity. This they did with not too much trouble. One group developed a profile for a Somali women with 2 children who was an asylum seeker and the other group came up with a single Polish worker who was a migrant. They then filled in the year 1 and the impact of the technology on people's lives. I then gave them a number of scenarios. These included: where asylum status was approved, problem with a child in school, computer was stolen, the situation in Somali got worse, the Polish worker decided to bring his family over, there was a backlash against migrant workers in the press. They all responded to this and changed their use of ICT. Overall the game worked really well in helping them define their problems and thinking about how ICT could be used in each case. What was interesting was that all the cards came into play. Once the infrastructure was in, and training given, both groups quickly went towards the social media type work and producing content. I would definitely use the game again. Gary also gave us some valuable feedback on how to improve the mechanics of the game, including changes in the timeline, and different ways of handling scenarios. Working in groups means those with more understanding of technology can explain to others. 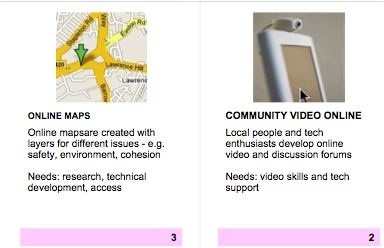 The range of cards means it is easy to describe what may be planned "for real" in an area, while also enabling people to ask "why can't we do that too". Moving into storytelling about local characters means the language and discussion is more likely to be in terms anyone can relate to - or challenge. The game sessions are not intended to lead to any firm decisions, but rather to trigger conversations that can continue afterwards. That allows time for reflection and evolution. For an good example of how our our technology planning game can be used, take a look at the web pages we developed after a day with Digital Champions on the west coast of Scotland. They were helping other residents take advantage of Scottish Executive funding that provided 2000 homes with free computers. Many of those present had experience of social media, and were able to offer explanations and tips to others during groups discussions. The different scenarios offered some fresh ideas and insights too, I think. You can see another US presenter at the conference, Marc Osten of Summit Collaborative, getting into the gaming sipirt. We had a wifi connection, and by the end of each session Beth had taken and posted pictures and results of discussions to the wiki. Nothing like showing what's possible on the spot. You'll see those on the wiki too. There's so much blah-blah-hype around social media is was wonderful to work with someone who has so many of the tools at their finger-tips - and is prepared to share. Beth and I had not met face-to-face before the event, but were able to work online to develop the presentation and game. Beth's use of the wiki during the event (subject to some dropped connections) was amazing. OK, we need to clean it up a bit, but that will be done with the energy and insights generated on the day. I'll reflect further later on the scope for integrating workshop activities and online tools ... and will be looking for other opportunities to experiment. The other delight at the event was a chance to meet up with fellow UK enthusiasts for social media including Steve Bridger, Miles Maier, Paul Henderson and Nick Booth. We can't rival Beth's US fellow social media bloggers yet, but I think a little blog community is emerging here around social media and social network where the focus is nonprofits and civil society. Drop a comment in here if you are interested in linking up - we hope to have a get together fairly soon. Beth suggested we start tagging social media posts with nptechuk ... the standard US tag is nptech.